january :: my new year's eve in a nutshell!! february :: hi, i am erika.... and i am a baby carrier addict!! march :: i am so happy that march is finally here! april :: it is 11:50 am and so far i am loving April! may :: i can't believe may is here already! june :: june brings the end of another school year, the beginning of another summer vacation, more birthdays and and daydreams of all the fun to be had! july :: yesterday was another sewing day~ this time it was pants. august :: we are home again. september :: it feels like september today. october :: i have to admit i was not at all ready for this week to begin. november :: the most exciting part of halloween is planning the costumes weeks in advance. december :: it snuck up indeed and i can hardly believe it is here! here's to celebrating our memories of the past and the memories to be made! happy, happy new year everyone! deep breath... the list is gone, the hustle and bustle has come to an end. nothing left to do but play! and that is exactly what we have been doing! esme' loves lucy (she even kept her name... awww!) she opened her first and then sat and played with her while everybody else opened gifts. finally one of the big kids reminded her that she had more presents to open. daddy made the kids a play kitchen this year! yay daddy!! it is not completely finished yet. it still needs little burners and he plans to add a shelf up above. the kids love it and it has been played with non stop! and i have had plenty of wood and wool felt meals these past couple days. esme' and i have been busy planning more and more play food... knit food, wood food, hand sewn wool felt food... it all sounds delicious! and now i am off to enjoy more of the after party! and sewed her little wool felt wings that slip on and off. i am hoping she will be well loved for a very long time! here is harper's little doll. it looks just like him! i did not make him, one doll per season is about all i can take on. i have named him sunny. and, lastly a breastfeeding mama doll with a tiny baby. i won this doll in a raffle at an event during world breastfeeding week. the whole bunch, ready to go under the tree! they can't wait to PLAY! we are loving the snow, playing a lot, eating a lot, enjoying each other, celebrating the solstice, and getting ready for the holiday~ i hope you are all having a beautiful season as well! sleeping in is wonderful! 'nuf said! it became a pocket on a very special bag! we have many more fabric crayon projects planned:: pillow cases, tee shirts, book bags, journal covers, bedtime bags... oh the things we can color! WHEE! pixie handbag is a popular girl! many of you have heard about the consumer products safety improvement act that threatens the lively hood of small toy makers and independent artisans and crafters who make children's products, such as myself. it is possible this act will go into effect just two months from now making it financially impossible for many tiny home based businesses to continue to operate. it is absolutely heartbreaking to think that this could have such a devastating outcome for those who love and support handmade items for their families. :: find your congress person and senators and write a letter like the sample here, particularly if they serve on the consumer protection subcommittee. :: send a letter directly to the CPSC. :: join the Handmade Toy Alliance and check out their proposed changes to the act which make a whole lot of sense. 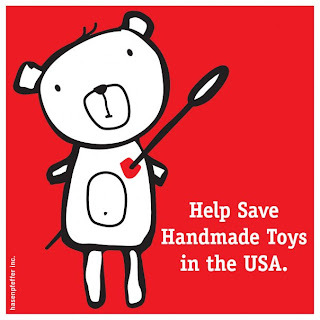 :: visit change.org and vote to save handmade toys from the CPSI~ with enough votes it will be presented to president Obama in january! :: are you on facebook? there is a group there too. :: spread the word to everyone you know who cares about helping the little guy, particular in today's economy. it is my hope that the CPSC isn't out to get the "little guy". maybe we will be heard and all will be right in the world of handmade. please show your support! esme' wandered away with my favorite wood brush, again, so i had to blow my hair dry using this miniature brush this morning. i prefer using a brush that is actually larger than my hand. the favorite brush was located several hours later, under her bed. we woke up to snow this morning. harper's response was "oh geez!" this is the first time we have heard him use this sentiment. it continued to snow all afternoon~ a snow day tomorrow, perhaps?? here is our little tree that the kids decorated. esme' and harper rearrange the ornaments several times a day. the star on top is crooked and won't stay upright. needless to say it fits right in. esme's handmade gifts are already under the tree. harper modeled this little earflap hat that i knit for my friend's nephew. i love it and think he needs his own. bad hair days and all! as promised, here is the whole flock! 1. i hate board games and card games. i will however play several rounds of Go Fish with esme' before kindergarten nearly every day because she loves card games. 2. i love tattoos! i have three. a rose on my ankle, a fairy on my belly and a bluebird and nest on my back. 3. i love birds too! but only wild birds. i am not a fan of pet birds. 4. i have a deep appreciation for sarcasm, and use it often. 5. i drink a lot of coffee, but decaf only. after miserably weaning myself off the caffeine when pregnant i swore i'd never go back to it. 6. i am a huge fan of live music. i have seen everything from the grateful dead to bb king to ac/dc. just the other night the mister and i went to a big rock show, because we're still totally cool like that! but i have been sewing instead. it's not looking very christmas-y around here. we don't have a tree yet. no stockings have been hung. we haven't even addressed our cards yet. i am really dropping the ball here, folks! we do plan to get a tree this evening. i think that may be just the thing to get me out of the slump that i appear to be in. in preparation of trimming the tree i spent yesterday afternoon cutting and sewing birds! today i am stuffing them. they are so sweet and colorful! most of them are for our tree but one will be sent off for this swap and another will go to a local ornament swap. and lookie there, in the middle, it's a HoLLy bird! i wish i had finished this little bird before HoLLy was shipped, i would have sent it as well! here are their pretty little bellies. i will take a photo of the whole flock this evening, perhaps posing in a holiday pine tree! LuCkY DuCkYs :: winners anounced! first of all ThAnK YoU to everyone who left such sweet comments about HoLLy~ i read every single one of your comments... all 559 of them!! i wish i had something to send to each of you! HoLLy will have a brand new home with Mommy's Home!! at My Creative Journal. and the winner of two patterns of her choice from keyka lou is Meg from Upcountry Views. *update~ michelle at keyka lou has offered a free pattern to anyone who spends $10 or more on patterns from her shop, now until 12-31-08! just mention that you are a reader of inspired mama musings and let her know which pattern you'd like for your freebie in the note to seller box when you checkout! here was my contribution to the swap~ they are little reusable grocery bags and pretend money, checks and wooden coins. i hope all the recipients love them as much as esme' seems to! and two pretty red wood sleds made by a daddy! hmmm, and now we are expected to wait until christmas to bring them all out to play?! torture. i will most likely pass the time knitting... sewing... making and baking... the more homemade the better! meet holly... yet another GiVeAwAy!! this is holly. how sweet is she?! she was created using the curvy clutch pattern from keyka lou. i modified her a little~ the curvy clutch has darts in the bottom, but holly has none. so here she is, all gussied up and festive, ready to assist you with your holiday shopping. she will hold your cash, gift cards or coupons. she can keep keys, sunglasses or lip balm from getting lost at the bottom of your bag. or maybe she will make a special appearance in someone special's christmas stocking! if you would like to give holly a good home simply leave me a little comment on this post and share with me what you would carry in this little clutch! and, for those of you who sew, michelle at keyka lou has generously offered one of you any 2 patterns from her shop! you can make your own little curvy clutch, or a pixie handbag like the one i blogged about recently. or both! the choice is yours! visit keyka lou's etsy shop and then come back and let me know which patterns are your favorite. feel free to enter both giveaways~ you will need to leave 2 seperate comments to do this. please make sure i am able to contact you through your blog or e-mail. i am only able to ship holly to US adresses only, but the patterns are sent via e-mail so anyone is welcome to enter. i will randomly choose 2 winners on sunday december 7th. 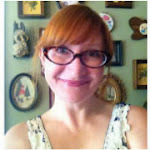 for more fabulous handmade giveaways visit sew, mama, sew for a list of bloggers participating in GiVeAwAy DAY! ::comments are closed~ WiNnErS will be posted soon! HUGE THANKS to all who entered!! every season my husband and i make several batches of irish cream to gift to our friends, family and neighbors. it is super simple, and has become a super popular gift with our crowd. we collect bottles throughout the year~ after trying empty bottles from different types of liquor we decided our favorite containers are empty flavored syrup bottles. you can ask your local coffee shop to save them for you. we also go through a few of the smaller syrup bottles in our home thanks to our new espresso machine! the smaller bottles are the perfect gifting size. blend, then pour into bottles. voila! homemade irish cream! i can usually fill 3-4 small bottles with one batch. you can also leave out the liquor and the almond extract and add some flavored syrup for a yummy coffee creamer. peppermint is really good! this will last 2-3 weeks stored in the refrigerator, but seriously, who is going to let this sit around that long?! i print out little tags to tie around the neck of each bottle and we gift them with a bag of coffee and some biscotti. they make wonderful host/hostess gifts! it snuck up indeed and i can hardly believe it is here! our holiday preparations and celebrations are in full swing. we have been slowly putting up christmas decorations around the house. tony hung lights out front yesterday. this morning esme' peeled the first sticker from the advent calender. and we have already watched the Grinch 3 or 4 times. i found this photo of harper seeing our tree for the first time last christmas. he loved it. and this year he is mobile and quick and grabby... oh, our poor tree!